Oklahoma City opens at art exhibit that is the first of its kind, Cole Porter’s music comes to Edmond, Lyric Theatre tells the story of a famous Oklahoma oil tycoon’s daughter, and spontaneous comedy takes over at OU in this week’s stage packed calendar of events. With roots as far back as the ancient civilization of Rome and the Ming Dynasty, all aspects of golf have been captured by a multitude of artists. 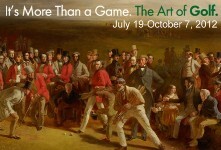 The Oklahoma City Museum of Art presents a new exhibit devoted to the sport organized by the High Museum of Art and the National Galleries of Scotland called “The Art of Golf.” It is the first ever exhibit devoted to the sport at a major art museum in the United States, comprised of 90 works by Rembrandt, Charles Lees, Norman Rockwell, Andy Warhol, and more. The showcase, completed by a video and full-color catalogue of essays by the exhibit organizers and experts, is open to the public beginning this weekend until October 7th. Summerstock Productions and the University of Central Oklahoma present one of Broadway composer Cole Porter’s biggest hits at the Mitchell Hall Theatre of the UCO campus in Edmond. “Anything Goes” is set on an ocean liner traveling from New York to London and features musical standards such as “I Get a Kick Out of You,” “It’s De-Lovely,” and, the play’s title song, “Anything Goes.” Local performer Renee Anderson portrays the lead character, a lounge singer named Reno Sweeney. Anderson has also performed with the Oklahoma City Philharmonic, Lyric Theatre, and other local production companies. Performances begin at 8:00 p.m. on Friday, July 20th and continue through the 29th of this month. Lyric Theatre Oklahoma continues its 2012 season with the Irving Berlin comedy “Call Me Madam.” This satire on American politics and foreign affairs is set in Washington D.C. in the late 1940s and early 50s. The musical revolves around socialite and widow Sally Adams and her appointment as the United States Ambassador to the fictional country of Lichtenberg. The lead character is based on historical figure and Democratic Party fundraiser Perle Mesta, who was appointed ambassador to Luxembourg in 1949. Mesta was also the daughter of wealthy Oklahoma oilman William Balser Skirvin. Performances at the Civic Center Music Hall run from July 24th through the 28th. The 4th Annual Improv Festival Oklahoma brings laughs and “Whose Line Is It Anyway?” type skits to the Meacham Auditorium stage in the University of Oklahoma Memorial Union July 19th through the 22nd. Presented by Red Dirt Improv, the four day festival features four dozen local and traveling comedy troupes. Performances include a range of improvisational techniques from fast-paced short skits to completely off-the-cuff plays. Improv workshops are also available for those interested, and performances begin at 7:00 p.m. on Thursday, Friday, and Saturday. The Oklahoma Children’s Theatre performs “Alice’s Adventures in Wonderland” from July 18th through the 22nd in Oklahoma City. Performances run Wednesday, Thursday, and Friday at 10:00 a.m. and 2:00 p.m. and Saturday and Sunday at 2:00 p.m. The Metropolitan Library System hosts the 4th annual Children’s Music Festival at metro locations from July 23rd through the 27th. Musician Aaron Nigel Smith, Dino O’Dell, and the Veloci-rappers perform songs that tell stories and encourage reading. The Fred Jones Junior Museum of Art on the University of Oklahoma campus in Norman screens the 1952 version of "Moulin Rouge" directed by John Huston. The film begins at 6:00 p.m. and is a fictional account of the famous French artist Henri de Toulouse-Lautrec’s life. The Kirkpatrick Foundation hosts a public discussion with animal ethicist and philosopher Dr. Bernard Rollin at the Oklahoma City Community Foundation on July 25th at 7:00 p.m. A reception at 6:30 p.m. precedes the presentation. For additional information and events in your area, visit the calendar page of our website.